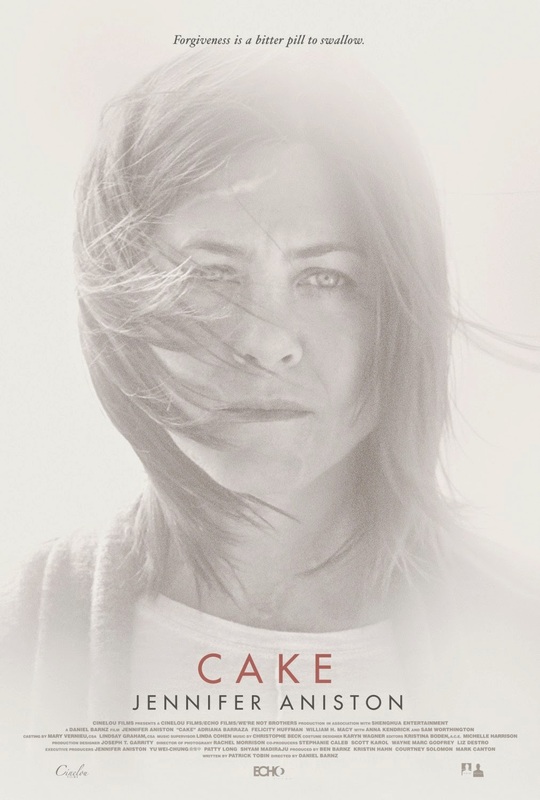 Watching the BBC's back-up movie programme Film (insert year here) recently, presenter Danny Leigh was less than kind about Cake - basically saying it was Jennifer Aniston playing Rachel Off Of Friends only without make-up. And this pissed me off, because Aniston can act - she's not just rehashing the character that made her famous. You only have to watch We're The Millers and The Good Girl to see that. But don't watch Cake to find out. Because Danny was right. Which has pissed me off again. Billed as a film about addiction (it isn't) and clearly aimed at The Oscars (it missed), Cake is actually an essay on suicide and grief. With jokes. Not great jokes, sure, but a couple of half-way decent stabs at black humour are attempted. The film centres entirely on Aniston's character Claire, a woman recovering from an accident and using pills to numb all manner of pains. She gets kicked out of her therapy group, her aqua-therapist threatens to drop her, her house keeper only puts up with it because... Well that's not made clear. It's probably the money. And through all this, Claire embarks on an ill-advised relationship with a dead friend's widower and takes up drug smuggling to keep the habit going. All of which raises more questions than it ever answers. Aniston, meanwhile, is basically playing Rachel. Sure, a potty-mouthed, barely-able-to-walk Rachel with no friends, but it's Rachel nonetheless. Right down to the hair. Amazingly this doesn't make it a bad film, but it doesn't make it brilliant either. Especially when both Anna Kendrick and Felicity Huffman act her off the screen during their brief appearances. The problems start with the central character being so unlikeable, and are compounded by the flimsy plot and weak supporting characters. And yet it's still not a bad film. It helps that Aniston is essentially a likeable screen presence, even if her character isn't. It also helps that Cake is shot so beautifully. It's glowing warmth does all it can to cover up the flaws, and the lack of music - bar one 'key' scene - actually works well. Partly because of the aforementioned issues, but also because of what this film could have been. There's a gritty intent that gets given a glossy sheen, there are real issues (chronic pain, drug addiction) which don't get covered in the depth they deserve. The fact it's so clearly aimed at the Oscar judges also goes against it. As mentioned, there are some attempts at humour, but they're ill-judged and would have been best left on the cutting room floor. What Cake should have been was a nasty, gritty film about a woman falling apart which had the courage of it's convictions instead of trying to get mass appeal. Instead, it's an Oscar wannabe, a film that wants to be liked (even if the central character can't be), a goodie-two-shoes that thinks jaywalking is a real crime. To be fair to Aniston, she's taken this role (and helped produce the movie) to prove she's got depth and range. Instead, we get to see what happened to Rachel after she left New York.